Seabourn is a cruise line unlike any other. 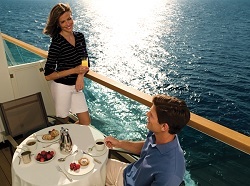 With Seabourn Cruises you are pampered from the minute you step onboard. During 2019 you'll be able enjoy Mediterranean cruises on Seabourn Odyssey, Seabourn Quest, Seabourn Encore, and the brand new Seabourn Encore! From the moment you first step aboard Seabourn, you'll be part of an exclusive circle, the privileged few, who have discovered the true joys of yachting. Aboard one of our intimate ships, you will feel like a welcomed guest. The captain and officers seem like old friends. Everyone on the professionally trained staff - more than one per suite - not only knows you by name, but knows your personal preferences as well. The days and nights are carefree and ultra luxurious. Personalized service is a way of life. Never lift a finger while you're a guest of ours, unless it's to signal a waiter for another bottle of vintage Bordeaux from the fully stocked wine cellar. Each cruise is a hand-picked collection of fascinating places, and each day brings a new opportunity for authentic discovery - another chance to explore your world in a personal and meaningful way. Your home away from home while cruising Europe is a superbly appointed luxury suite. Here, you can revel in sublime comfort as the world passes by. Measuring an ample 277 square feet or more, your Seabourn suite is an ideal haven. The sea is always in view, framed by the expanse of a five-foot picture window or the doors of your balcony or verandah. Fine Egyptian cotton linens, a fluffy duvet and king-sized down and feather pillows encourage the indulgence of afternoon naps. Sunshine enters your suite each day in the form of your personal suite stewardess. Whether she draws the warm, scented bath of your choice from our Pure Pampering menu or surprises you at night with a sprinkling of rose petals on your bed, she helps make your wishes come true. Our fervent dedication to exceeding your desires follows you ashore. We shun the ordinary when it comes to experiences in the off-the-beaten path destinations of our ships. Want to take a breathtaking journey by hot air balloon over the soaring rock formations and narrow canyons of Cappadocia, Turkey? We'll attend to all the details. Planning a romantic evening for two in Paris? We'll arrange for a horse drawn carriage and fill it with flowers, champagne and hand dipped Belgian chocolates. Call ahead and let us help you plan your special day. Some of life's most cherished moments occur around the table, and every meal with Seabourn is another opportunity to celebrate. Seabourn's award-winning cuisine starts with the finest quality ingredients, infused with authentic regional flavors, prepared a la minute by our skilled chefs and served with pride. Each Seabourn ship offers a choice of dining venues to suit your mood of the moment, and nearly all are open-seating, inviting you to dine where, when and with whom you wish. 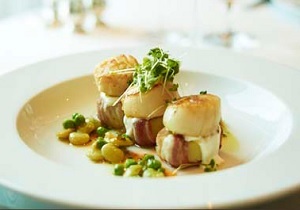 Choose the sophisticated fine dining ambiance of The Restaurant. Enjoy a more casual indoor/outdoor venue, or savor the view and a perfectly grilled steak under the stars on deck. Restaurant 2 provides innovative, small-plates tasting menus for a delightful change of pace. Complimentary fine wines are poured with lunch and dinner, and there is never an extra charge for any dining choice. You can even enjoy a meal in your suite or on your veranda, with our compliments. Seabourn is a proud member of Chaine des Rotisseurs, one of the world's most prestigious gastronomic societies devoted to the art of fine dining. We know that you expect and appreciate fine food and quality ingredients. We know that you also share our dedication to responsible stewardship of natural resources. For that reason, we are especially proud to be able to offer you Black River ossetra sturgeon caviar, which is sustainably produced by a unique wild-farming method that enables our enjoyment without compromising the species' future. Helping you create the perfect day is something we take to heart at Seabourn. It's why our lounges and decks are open and inviting, the ambiance relaxed and the variety of activities offered plentiful. Work out in your ship's well-equipped fitness center, with cardio and resistance equipment. Strengthen your core with complimentary Pilates and yoga classes, or book a private session with a personal trainer. Expand your horizons in our library, at a port lecture or at one of our many inspiring enrichment programs. Enjoy a complimentary Massage Moment on deck. Indulge your need for pampering at the spa, or pamper your palate at a food or wine tasting. Many voyages feature our signature Caviar in the Surf Beach Party or a Marina Day, inviting you to enjoy complimentary watersports right from the back of your ship. Guests gather in our lounges for pre-dinner cocktails and canapes, sharing the day's adventures with each other. For some, this is their favorite part of the evening. Each night offers something new. Enjoy a sophisticated cabaret one night, or a game of Blackjack in the casino the next. You can dance the night away at The Club or enjoy listening to piano music at the Observation Bar. Some of our signature events take advantage of the beautiful night sky, including Movies Under the Stars, and dancing to live music at an Evening Under the Stars. And, before retiring, consider a nightcap at the Sky Bar to celebrate everything you've experienced on your fantastic voyage, and all that lies ahead. One thing is certain. The day is only just beginning when night falls aboard Seabourn. The world may not be transformed after your visit to The Spa at Seabourn, but you certainly will be. From the moment you inhale the scent of Rosewood oil, relaxation sets in, preparing you for an experience designed for pure pampering. Choose from a variety of spa treatments and rituals that range from massages and facials to body treatments and wraps. Or our expert staff will be happy to customize a spa regime restoring you to a state of pure contentment. All of our therapies incorporate natural ingredients to inspire harmony, vitality and an enhanced sense of wellness. Relax in a sauna, a steam room or visit the salon, where a full range of services is available. You'll even find expanded spa facilities of up to 11,400 square feet aboard Seabourn Odyssey, Seabourn Sojourn and Seabourn Quest, where you may choose to reserve a private Spa Villa for the ultimate experience. There really is nothing quite like being pampered in a place that redefines the meaning of true bliss. The art of conversation has always been central to the Seabourn experience. Our voyages attract interesting, interested people - people who enjoy talking together, sharing their interests, their adventures and discoveries, and their life stories with longtime and newfound friends. Their enthusiasms and curiosity are far-ranging, and these are what spark their desire to travel the world. To encourage and enhance this satisfying aspect of your Seabourn voyage, we invite luminaries of particular interest and accomplishment to join our guests on board - and bring fascinating insights, expert opinions and delightfully entertaining diversions to the conversation. Daring explorers, heralded chefs, learned scholars, celebrated performers and renowned experts from every arena of the arts, sciences, politics and the humanities share your journey on our intimate ships. They each bring skilled presentations of their expertise for guests to enjoy. But just as importantly, they participate in the daily social scene, sharing meals, adventures ashore and casual chats throughout the voyage. On some ships, they lecture. On Seabourn, they join the conversation. Celebrity Conversations feature actors, singers, and other entertainers. well-versed in such disciplines as geography and history. discuss international relations, politics and economic affairs. physicists and other researchers for answers. 7 Day Greece & Dalmatian Coast Cruise From $3899 US!